THE HISTORY OF THE CLIPPER ROUND THE WORLD YACHT RACE. Sir Robin and William Ward form Clipper Ventures. Sir Robin Knox-Johnston becomes the first person to sail solo non-stop around the world, when he won The Sunday Times Golden Globe Race. When I first had the idea of organising an around the world yacht race, more than 20 years ago, I couldn’t possibly have imagined just how big this event would become. Or indeed how many lives it would change and how many opportunities it would present to those brave enough to rise to the challenge. The Clipper Race has changed immeasurably but its core values remain. It is still a truly unique yacht race, open to anyone no matter how experienced or inexperienced, no matter how old, no matter what background. The beauty of the ocean is that it doesn’t care if you are a seasoned ocean racer or a nurse on your first crossing; it still serves up the same challenges at the same intensity. 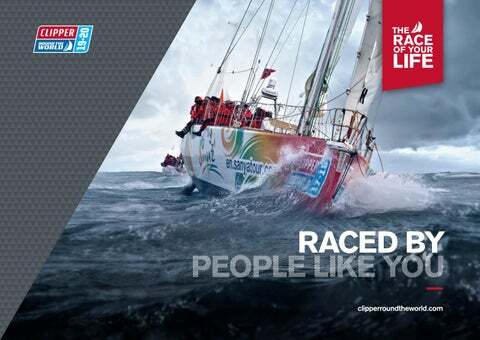 People take on the Clipper Race because they have a desire that sets them apart. They want to live life to the full. The easy choices in life often offer no pleasure; it is the hard and difficult challenges that bring the satisfaction of real achievement. I remember my first circumnavigation, the challenges I faced in 1968 to raise the money I needed to get my campaign up and running. The sacrifices I had to make, that my family had to make. My dream was always to make the globe’s oceans more accessible and to give people the opportunity to do what I had done, with far less of a sacrifice but with the same weather - gales, the Doldrums, trade winds, freezing cold and blistering heat. MY CHALLENGE TO YOU IS SIMPLE DARE TO DREAM Because something as huge as this starts with just that. If you follow that dream, who knows where you will end up. I promise you one thing, you will enjoy the journey. COURAGE IS Inspirational Clipper 2015-16 Race crew member Gavin Reid, 28, was born deaf in both ears but refuses to let that stand in his way of completing any challenge he puts his mind to. When Gavin set out on the Clipper Race two years ago, he had no idea that a mid-ocean rescue would see him return with leading industry awards for outstanding acts of seamanship. As his team approached a distressed yacht mid ocean, Gavin was the fearless Clipper Race crew member who volunteered to swim from the Clipper 70, hoist himself up to the top of the swaying mast and patiently spent two hours untangling lines until the crewman was freed. Gavin then safely lowered the crew member back on deck before returning to Mission Performance. Having spent eleven months sailing round the world, achieving something so momentous, I have learnt that you can achieve what you set out to do… I had the confidence to do that and help others. I was almost a complete novice sailor when I joined the race. This was an experience that changed my life-perspective forever. The more I became one with nature, the sea, the wind, the boat, the more I grew stronger as a person. I found my passion for life again. I was recovering from a sports injury when I applied. The race was a physical challenge and I pushed myself to regain my confidence. I enjoy it when the waves are coming over the boat in rough weather. I’m one of the few people able to helm the boat in these conditions. It gives me elation and makes me feel trusted. When you do this for a year you know it’s going to take endurance, persistency and hard work but that’s the fun of it; that’s what you want. Sailing around the world is something only a handful of people will ever do in their life. I didn’t really believe I could do this, Physically, emotionally. But I’ve come back and I’ve done it. I’m an ordinary woman and I’ve done something extraordinary. My primary motivation was to learn to be a better sailor. What I didn’t expect was to learn more of the teamwork and leadership aspects which really made me appreciate this experience even more. THE COURSE SETS OUT AN INTRIGUING MIX OF SAILING CONDITIONS AND CHALLENGES FOR CREWS. Furious storms in the South Atlantic, intense tropical cyclones in the North Pacific, the Roaring Forties of the Southern Ocean and of course the biggest dread of all no wind at all. EVERY LEG MATTERS Each edition of the race is different, typically there are 13-14 individual races. eleven points are awarded for 1st place and one point for last. This keeps the racing exciting and competiitve with each of the eleven teams lining up at Race Start together. 1 nautical mile (nm)= 1.852 kilometre and 1.15 miles. 07 Disclaimer: The dates and location information provided here are for your guidance, based on previous editions of the race. The Clipper 2019-20 Race route and schedule will become available closer to departure. Distances and estimated days racing will be confirmed prior to your race start. In addition to the racing days shown per leg, time is spent in port preparing for each race. ROUND THE RACE DIRECTOR MARK LIGHT OUTLINES WHAT CREW SHOULD EXPECT AS THE CHALLENGE TO RACE AROUND THE WORLD UNFOLDS RACE BY RACE. CIRCUMNAVIGATION EXPERIENCE EVERYTHING Welcome to one of the biggest challenges you can imagine. To complete the Clipper Race you will need to stay mentally focused and competitive, keep in top physical shape and cope with living on a 70-foot stripped down ocean racing yacht for eleven months. Nothing can fully prepare you for a circumnavigation of the globe; the range of emotions you’ll go through while racing and the sense of achievement when you cross the finish line after 40,000 nautical miles of gut wrenching, energy sapping ocean racing. You might start as a sailing novice but by the end of eleven months at sea you will have more than 40,000 racing miles in your log book. You will have sailed in all conditions from warm trade winds, through winter storms and the tropical heat of the Doldrums, crossing the Equator twice. You will have been becalmed, battled through 65-knot gales, struggled through squalls of stinging rain, snow flurries, sleet and fog. You will have experienced the emotions of untying your lines and saying goodbye to loved ones as you head into the drama of your first Race Start in front of the world’s media and tens of thousands of spectators. Typically, you will have visited more than twelve to 14 ports and been welcomed ashore with all the fervour deserved for long distance sporting champions. You will have celebrated at prize givings, shaken hands with the great and good, made friendships that will last a lifetime and realised you can achieve more than you ever thought possible. You will be fitter, healthier and more alive than you dared to believe. You will have joined an elite club and, as you return to the point of departure and cross your outward track in the world’s longest yacht race, you’ll head home with a set of experiences that will live with you forever. You have just become a circumnavigator. LEG 1 THE ATLANTIC TRADE WINDS LEG After experiencing the emotions of saying goodbye to loved ones, there is a huge range of conditions to battle - the Doldrums, Trade Wind spinnaker sailing, the first Atlantic crossing and celebrating South American style. The first ocean crossing - The Atlantic - sees the crew at sea for four weeks. After crossing the start line, the first challenge will be to negotiate the fast running tides around the UK and Northern France. The Bay of Biscay, notorious for violent storms and heavy seas, could present its own challenges and teams will be eager to cross it quickly. The adrenaline-filled start over and settled into watch systems, the first major tactical decision of the Clipper Race comes quickly. The Canary Islands are on the direct route. The decision whether to leave them to the east, sail through the middle or pass on the west delivers a major tactical headache. Pick the wrong route and teams could end up in the lee of the land, watching the rest of the fleet accelerate towards the Cape Verde Islands. Typically sitting just north of the equator, the Doldrums will be waiting to test teams mentally and physically with unpredictable conditions, big wind holes, squalls, and high temperatures. The first equator crossing of the race will call upon King Neptune to pay the boats a visit and a ceremony will turn Pollywog crew into Shellbacks – it’s a real leg highlight! Teams will then continue south to pick up the easterly trade winds, being careful not to get too close to the South American coast, and head all the way to the finish line. You can look forward to celebrating your achievement in typical South American carnival style. A day before departure I found myself contemplating the adventure I was about to embark on. I kept wondering what would it feel like having no land in sight, knowing that you’re so far away from it in every direction, would I be scared? Riding those incredibly tall and long waves was far from scary, it was exhilarating; it was liberating; it was a real adventure! LEG 2 THE SOUTH ATLANTIC CHALLENGE One for thrill-seekers! After leaving the South American coastline behind, the fleet heads south east into the infamous South Atlantic. Storms, Albatross and tactical decisions - how far south to go? How big will the first weather system be? Do you race the rhumb line or add miles looking for stronger winds? There are big decisions that can mean the difference between a podium position and a mid-fleet finish. Upon leaving South America, teams will be straight into the Trade Winds and the long, rolling swells of the Southern Atlantic as they head south towards the Southern Ocean with spinnakers flying. Tactical decisions await. Heading south before turning east will be the longer route, but could offer more consistent wind. Heading east directly shaves off hundreds of miles but could leave the yachts too close to the windless centre of the St Helena High (South Atlantic High). As a predominantly downwind leg, the asymmetric spinnaker will feature heavily, though crew will need to be careful not to overpower it as a blown spinnaker will compromise the rest of their race. As the fleet ducks south, long rolling swells will provide fantastic conditions for surfing down waves. An exhilarating leg, boat speeds will easily be in excess of 20 knots and some teams have previously reported speeds of over 30 knots as impressive fountains of water emerge over the bow. As you close in on the point where the Atlantic meets the Indian Ocean, the race will be almost over. The traditional African welcome awaits as you finally step ashore having crossed the South Atlantic Ocean. LEG 3 THE SOUTHERN OCEAN LEG After a Parade of Sail past waving crowds, it’s out onto the waters of one of the world’s Great Capes – Good Hope – and getting ready to face what, for many sailors, will be their ultimate challenge. Also known as the Southern Ocean Sleigh Ride, this leg offers some of the most exhilarating and testing conditions of the entire circumnavigation as teams dip into the notoriously strong winds of the Roaring Forties which lies between 40 and 50 degrees latitude. Once clear of the stunning but often fickle winded Table Bay, crews will make their way to the first Great Cape, The Cape of Good Hope and onto the Agulhas Bank, an area notorious for very disturbed seas where the Indian and Atlantic Oceans meet. Spinnakers are likely to re-appear and ocean racing tactics will be in full flow. as teams get to discover exactly what the Clipper 70s are made of as they surf downwind at more than 25knts on some swells higher than buildings. Despite the gruelling reputation that the Roaring Forties command, this is a place respected by sailors as one of the best places to fully appreciate Mother Nature in her most raw and powerful glory. SOUTH AFRICA // WEST COAST AUSTRALIA We are now in Southern Ocean below 40 degrees South and it is a place of contrasts. Over the last few days we had 70 knot wind gusts, big waves, horizontal rain, and beautiful sunshine, double rainbows, 15 knot breeze in which we surfed our heavyweight kite. LEG 4 THE ALL-AUSTRALIAN LEG This is an exhilarating, hold-on-to-your-hats type leg. It will challenge you in every way. The constant changing conditions, from brutal to mild mean there is no relaxing, pushing you mentally physically and emotionally. The fleet will first head deeper into the Southern Ocean, to the most southerly point of the entire circumnavigation. Crews can expect plummeting temperatures and vigilance will be key as they experience some of the most inhospitable parts of the planet where icebergs flow north from Antarctica. Some teams may choose to head south of the rhumb line to take advantage of stronger winds, though this will add extra miles to their race. Those that choose this option will need to watch for building low pressure systems heading west around the bottom of the planet. Stay too high and teams risk lengthy wind holes in the Great Australian Bight. As you round the southern tip of Tasmania you will then make the turn to head north and across the notorious Bass Strait. Traditionally a downwind section of this race but equally with the ability to provide steep seas and challenging conditions. Continuing, you will be sailing against the famous East Australian Current which flows south and east along the coast and can reach speeds of up to 4 knots. This presents another tactical challenge â&#x20AC;&#x201C; whether to stay inshore and reduce the overall distance or whether to head offshore, increasing the mileage, but escaping the effects of the adverse current. After an exciting race, you will experience stunning scenery and fantastic tropical sailing conditions as you approach your east Australian destination. As I write this I can hear the howling of the ocean breeze, roaring and screeching above me up on deck. It is a familiar sound, but nevertheless still one that fills me with nerves and excitement. There is a real sense of the unknown about it and as you make your way up the galley stairs and out in to the big bad world, only then do you find out what little treat nature has in store for you. This leg offers some of the most varied conditions of the race. Teams will be tested in the extreme as they adapt to a host of changing sailing and climate conditions. The first Le Mans start of the Clipper Race will set the fleet heading north and as the temperatures begin to soar as crews reach the equator, the breeze may well drop. High levels of concentration will be needed as every tweak will affect the boat speed and teams with strong light wind sailing skills may use this time to their advantage. The second equator crossing will see the return of King Neptune for the second equator crossing ceremony of the race. Here, crews are likely to witness some spectacular lightning storms and passing squalls can offer some much-needed relief from the heat, but can bring some heavy storm conditions with them. Continuing north past the equator, the wind will start to build as the fleet enter the North East Monsoon where teams will be looking to pull away. A hero’s welcome and spectacular ceremony attract huge crowds in the Chinese Host Ports of Sanya and Zhuhai where you’ll have time to recouperate and experience the richness of the local culture. I grew up living in cities and this was my chance to do what I really wanted to do. I was looking forward to experiencing everything first hand - not through the internet. I enjoyed looking at everything afresh; different weather conditions, temperature extremes, challenges, the wildflife, the ocean, learning the language of the sky. You can’t do that in a one-off holiday. LEG 6 THE MIGHTY PACIFIC LEG Few people dare to cross the Pacific, the world’s largest ocean - and for good reason. Nothing will give you a bigger sense of achievement than overcoming its enormous waves and storms. Before teams reach the Pacific Ocean, they are likely to have to navigate fog, fishing boats or even snow. It is then a race to the tip of Japan where the ‘Black Stream’ (Kuroshio Current) runs west to east and can help propel boat speeds, but the vicious current can also come at a cost of big seas with confused waters and teams will have to be careful not to get caught out. Once clear, the North Pacific awaits and will soon bring with it some very cold temperatures, big conditions and dark nights. Referred to as ‘The Big One’ with good reason, the Pacific is the world’s largest ocean and at times the closest humans to the Clipper Race teams will be those on the International Space Station. I used to sail with my family but this race helped me go to the next level. Now I’m crazy about sailing. Being able to race with a team and achieve something together was really new for me and was amazing to have this experience. Putting all the energy into it and improving together - I will never forget that feeling. LEG 7 THE USA COAST-TO-COAST LEG Big tactical decisions, rising temperatures and easing winds characterise the all-American leg. Passing through the Panama Canal, one of the Seven Wonders of the Modern World, is also a unique experience, particularly for the engineer crew members. The first big question is whether to take the inshore or offshore route. The Californian Current flows South, but the helping hand this gives can be counteracted by heating effects from the North American land mass which might change the winds unfavourably. The race down to the coast of Mexico should be a fast one but as the breeze becomes lighter the racing becomes more intense. Conditions near the ITCZ (Inter Tropical Convergence Zone - or Doldrums) could decide the final finishing positions off Panama. Once the fleet has transited the 41 nautical miles of the Panama Canal, the yachts will set off on an upwind battle north. Many sail changes will be required due to lighter winds near the Windward Passage between the islands of Cuba and Hispaniola, which mark the exit from the Caribbean Sea into the Atlantic Ocean. Wind will also be variable because of the depressions coming from the North American land mass. Thunderstorms are likely to provide some spectacular backdrops with the air alive with static and lightning cracking into the sea around the finish line in the Ambrose Channel outside the Big Apple. Everybody goes to New York once in their lifetime, but sailing into New York - around the Statue of Liberty - thatâ&#x20AC;&#x2122;s the way to enter a big city. This is something only a handful of people will ever do in their life. LEG 8 THE ATLANTIC HOMECOMING LEG While this might be the homeward bound leg, there is plenty of racing still to be enjoyed. First place overall was decided on the final race of this leg on more than one occasion. On the classic race route there is the potential for some very fast sailing. Whilst it may be the end of the adventure, the memories of all that has been endured and celebrated will last forever. Taking a popular route across the North Atlantic, the fleet will initially head towards Canada. The Grand Banks, at the southern tip of Newfoundland, is renowned for thick fog patches and light winds as the Labrador Current brings cold water down from the Arctic, which will demand vigilance from crew and Skippers. As the fleet passes close to the wreck of the Titanic before heading over the Flemish Cap, the setting for The Perfect Storm, teams will need to be on constant look out for icebergs and growlers (smaller submerged ice) and a strict Ice Limit will be set by the Race Office to keep teams from heading too close to the ice fields. Weather in the North Atlantic can be as heavy as the Pacific with depressions swirling across causing high winds and big swells. Continuing east back towards Europe, some fun and fast downwind sailing is on offer in prevailing westerlies. With final points up for grabs, there is still everything to race for as you sail into a port in Northern Europe. Finally, an exhilarating power sprint home to complete the adventure of a lifetime. With podium and final positions likely to be in close contention, and the possibility of some Joker Cards still to play, this will be an intense final fling where anything is possible. I’m incredibly proud of what we’ve been able to achieve as a team. I’ve made fantastic friendships and been though some life-changing moments. After being on the boat for eleven months it’s going to be a massive wrench and it will feel very strange. You never know, my son feels invigorated by this and maybe he’ll continue in a future race. EAT SLEEP SAIL TELL YOUR STORY TO THE WORLD. As you embark on your journey of a lifetime, your family and friends will want to share in the experience with you while you race. Each yacht is equipped with a global communications system allowing you to send emails to a personal account and to make satellite telephone calls whilst at sea. Designed by renowned naval architect Tony Castro, the 70-foot yachts are faster and more dynamic than before, taking the race to a new level. Features include twin helms, twin rudders and a six-foot bowsprit which allows the inclusion of three large asymmetric spinnakers to complement a suite of Yankee headsails all add to increase performance and boat speed. CLIPPER 70 THE BIGGEST MATCHED OCEAN RACING FLEET. The twelth edition of the race will see eleven Clipper 70s making up the biggest matched ocean race fleet in the world, and of course it will make history as the biggest ever Clipper Race. The state of the art hull produces better performance and control, especially in the light winds encountered near the Equator or between weather systems when crossing oceans. Crews surfing on big seas can expect to exceed 30 knots when conditions suit. ROLES A CLIPPER 70 IS NOT A PLACE FOR THE FAINT HEARTED OR WORK-SHY. As a crew member you will be trained as an ocean racer, working as a team to be a self-sufficient unit capable of taking care of any situation, no matter what the conditions. You will be able to get involved in all roles on deck - as bowman, pitman, mastman, helmsman and grinder or go on to specialise in the areas where your strengths lie. The Bosun leads the seamanship team and reports to the Skipper for the maintenance, servicing and repair of all deck equipment pre-start, at sea and in stopovers. Also assists the Skipper with comprehensive rig checks. Other responsibilities include care of standing and running rigging, winches, halyards, sheets, guys and blocks, and whipping, splicing and care of ropes. The on board Engineer will lead the engineering team and is responsible to the skipper for keeping the mechanical, electrical and plumbing systems in full working order. Ensures the Skipper and team is properly fed and watered for the duration of the race. Must plan the menu for each leg, taking into consideration nutritional and calorific content of meals depending on weather and duration of the leg, purchase food and general supplies and manage the team catering budget. The Victualler will be highly organised, good with numbers and dedicated to keeping their team efficiently fuelled. Leads the sail repair team and is responsible for the maintenance and repair of the team’s sail wardrobe. The condition of the yacht’s sails will be critical to racing success. The Stopover Manager is responsible, under direction of the skipper, for organising the yacht and crew stopover program. This may include ensuring rig and safety checks are completed, organising the deep clean of the yacht, being on hand to supervise and/or organise the crew to ensure all tasks are complete as well as managing maintenance days. You must have good leadership and organisational skills in order to allow maximum time for rest and recuperation ashore. The Team Coordinator helps the skipper with yacht administration and organisation. This includes compiling yacht paperwork for customs and immigration on arrival and ensuring the Skipper has completed post and pre-race paperwork. The role requires good planning and timemanagement skills, integrity and tact. A vitally important role shared amongst crew, Mother Watch are responsible for preparing and cooking tasty, hot, nutritious meals and snacks throughout the day. The role includes monitoring fresh food stores to ensure longevity, cleaning and restocking the galley, ensuring crew are keeping hydrated and energised and remain prepared to be on deck to help with evolutions if needed. However, the hard work of keeping moral high throughout the day comes with its rewards, a full night of sleep. Looking after the main engine, generator and water maker and all servicing and repairs en route and at stopovers is essential. The Social Secretary helps to manage the crew fund, acts as a liaison with the families of the team, may organise team kit, social events, team building, manage or curate social media and anything else that will help bring the team together. Once the race is in action, the cohesion of the whole team is maintained by having a strong link between those sailing and legger’s who are yet to join, or who have just completed their race. MEDICAL ASSISTANT The Skipper is ultimately responsible for medical care, but the Medical Assistant is trained to support with any injuries or illness on board. Also helps to ensure that medical kits are correctly maintained and resupply requests are made. MEDIA CREW The Media Crew Member organises the media output from the yacht. This includes blogs, photos and videos for the website and helping organise crew for any media interview requests. RACING There are as many reasons to participate as there are crew - to learn, to discover, to challenge, to encourage. PERHAPS THE GREATEST EXPERIENCE OF ALL IS THE THRILL OF WINNING. The Clipper 2019-20 Race is the event’s twelfth edition. To date, more than 5,000 crew members have competed in over 150 races. Whether it marks the courage of an ocean crossing or the pace of coastal racing, each is marked in true celebratory style, watched on by the world’s media. RACING As a member of the Clipper Race crew, youâ&#x20AC;&#x2122;ll be taking on one of the greatest challenges on Earth, testing your wits, skills and courage in an endurance race across the toughest oceans. At the same time we see vulnerable children and environments around the world experiencing even more precarious challenges. TOGETHER WE CAN HELP BUILD A BETTER WORLD. Since itâ&#x20AC;&#x2122;s inception, the Clipper Race has been fund raising for charities and supporting corporate social responsibility programmes around the world. As part of your race campaign, you may also want to raise funds and awareness for the Clipper Race Charity by participating in activation opportunities pre-race ad at each stop-over port. WORLD CLASS AROUND FORTY PERCENT OF CREW HAVE NEVER SAILED BEFORE. A core element of the Clipper Race experience is our pioneering training programme that enables novices and skilled yachts-people to tackle the most challenging situations on the planet. We take the lessons from having raced more than three million miles, and apply them to our global training courses, constantly updating material to ensure our crews are trained to the highest level. Working with our professional skippers and mates, you will live onboard 68-foot and 70-foot yachts. From day one you will build teams, learn the ropes, cook, clean and race. On top of that youâ&#x20AC;&#x2122;ll learn the basics of yacht maintenance and management, racing tactics, survival at sea and weather routing to weather conditions. The most important skill youâ&#x20AC;&#x2122;ll learn is being part of a multi-disciplined high performance team that will function in every condition that Mother Nature can throw. There are four levels of compulsory training, each is an intensive physical and mental programme. Each of the one-week courses must be completed successfully before you race but this can be scheduled backto-back or spread over several months. Your fitness levels will improve during training and while racing but your pre-race fitness programme will benefit you and add to your overall enjoyment of the race. To be a great sailor, you first need to be a safe and competent sailor. During week one you will be pushed to your physical limits. You’ll understand just how well you will be able to function while cold, wet and tired. How to live at a 35-degree angle for prolonged periods while racing. You’ll learn to work in a watch system, race with broken sleep as you sail through the night. You will be amazed at how the skills you learnt on Level 1 come back to you. Not quite like riding a bike, more like riding a bucking bronco – in a washing machine. As your skill and confidence levels increase so will the demands we place on you so that when you race for real, you will do things right first time and quickly. We will help you build your confidence and stretch your comfort zone. The Clipper 70s fly asymmetric spinnakers, which are great fun, fast, furious and rewarding, although more technical and physically demanding. Here you will really hone your sailing skills. Everything will be about sail trim, making the boat go faster and understanding the weather systems that you’re racing in. As part of the selection process you need to successfully complete Level 1 before you’re guaranteed a place on the Clipper Race. You’re almost there; you can feel the Race Start. Now it’s time to put the final touches to your pre-race training. Here you will train with your skipper and team while racing against the rest of the Clipper Race fleet. You will practice Race Starts, build and really get to know your team and importantly start to work on a psychological edge over your rivals. There are no race points at stake during Level 4 – but you’d better believe that the race has started. Imagine the feeling as you win practice race after practice race. GETTING THE YOUR PERSONAL RACE CREW CLOTHING PACKAGE. When you face the world’s most extreme ocean conditions, you need the world’s best ocean sailing clothing. Because when a sailor is protected on the outside, they are stronger on the inside. From Musto’s collection, we’ve hand picked a technical clothing package, tried, tested and approved by professional ocean racing sailors who venture to the most extreme places on earth. Valued at over £1,500 RRP the technical clothing package is included in the cost of your compulsory training and contains the renowned HPX GORE-TEX Pro Series Smock and Salopette. YOUR SUPPORTERS YOUR FRIENDS AND FAMILY PLAY AN IMPORTANT ROLE IN YOUR EXPERIENCE, WHETHER MEETING UP WITH YOU IN PORTS AROUND THE WORLD OR FOLLOWING YOUR JOURNEY FROM THE COMFORT OF HOME. RACE VIEWER By checking the Clipper Round the World Yacht Race website regularly, family and friends can access the most up to date information on the boatsâ&#x20AC;&#x2122; positions via the Race Viewer. It is updated every hour and will be active as soon as the race starts. We encourage your loved ones to get involved with your adventure, providing backup and a friendly face to those travelling to meet you, and through gettogethers to share information. FUTURE CREW Junior Crew Supporters activities provide a way to connect further with the race and help them feel a part of the Clipper Race family while their loved one is at sea. CREW FROM AROUND THE WORLD ARE TAKING ON THE CHALLENGE OF A LIFETIME. Where did you first hear about the Clipper Race? Do you have any additional qualifications or skills that you feel would be beneficial to your application - such as medical, mechanical, electrical, computing, electronics, sail making? YOUR EXPERIENCE - CONTINUED Describe the biggest challenge that you have faced? Please accept my application for the selection interview for a crew place in the Clipper Round the World Yacht Race. I request a one-time electronic payment link in order to transfer the £100 registration fee to Clipper Ventures PLC. I understand the following will apply: 1. That in the event of my application being successful the £100 will be credited to my final invoice. 2.	That in the event of my application being unsuccessful, the company will refund £75 with £25 being retained to cover administration costs. 3. That in the event of my being offered a place as a crew member on the race which I subsequently do not take up for whatever reason, I will forfeit the £100 registration fee. What are you looking to get out of taking part in the Clipper Race? CIRCUMNAVIGATE THE WORLD £43,500 Experience everything and race around the world. Total cost of berth Training Package plus combined cost of chosen legs of full circumnavigation. Spread the costs over several months. You can pay be standing order commencing the month after your contract is processed. * Compulsory training element consists of 26 days of Race Crew training and technical clothing (worth over £1,500 RRP). WE’RE HERE TO HELP YOU PREPARE FOR THE RACE OF YOUR LIFE. What are you looking for in a crew member? There is no ideal person or typical crew member. We have had every age between 18 and 73 on the race and more than 40 nationalities and experiences ranging from complete novice through to Yachtmaster. What is crucial is your level of desire, determination and enthusiasm. You need to be a team player and someone who is tolerant, forgiving, understanding and supportive. If you have these soft skills we can turn you into an accomplished ocean racer. Everyone coming to the Clipper Race has a different level of fitness. Teamwork and technique are just as important as brute strength so our training will show you what areas you may need to work on. During the race you can burn around 5,000 calories a day. Not only are the yachts identical we also make sure that the crew is matched so it is still an even and competitive race. We spread the ages, experiences, vocations and nationalities across the fleet. Of course if you have a particular yacht that you would like to represent please tell us. But we cannot guarantee being able to grant your request. What kit will I need? We provide you with the essential sailing and team kit package from a range by Musto. Depending on the races you choose, we will advice you on other items you may wish to add. We also supply your life-jacket, AIS beacon and other safety equipment. What happens in port? Following the initial celebrations of your arrival, your first priority is the yacht’s maintenance, preparing for the next race, re-provisioning and race planning. You’ll want to participate in events with your team partner including the Prize Giving ceremony. And catch your breath with friends and family as you see the local sights. Trial and error. Everyone finds a different remedy that works for them; an over the counter medicine, herbal remedies like ginger, wrist bands that apply pressure to key points and even cotton wool in the ears. The worst case scenario is you feel terrible for 48 hours and then your body adjusts. Does it matter that I’m not a sailor, nurse or engineer? Not at all. Being good with people and being self-aware is far more important. Your unique life experiences will bring as much to the team as your career and background. How much personal kit can I take? As a team you will make that decision. Everything you do is a fine balance between having enough and having too much. Too much adds weight and slows the boat down. Not enough means you are cold, wet and demoralised. Somewhere between 20 and 30kgs of kit is typical. How flexible is the training? Very. We run course most weeks of the year and you can plan well ahead of time. You will soon find training dates online so can plan around your own projects, holidays, family and other commitments. Can family and friends get involved? We encourage family and friends to get involved with your adventure. We provide background support to those travelling to meet you in all the stopover destinations, and will help set up a ‘Race Crew Supporters’ groups to share information and organise get-togethers around the world. AROUND THE WORLD Our website features an interactive race viewer tracking the latest positions and news from onboard each yacht. Our social channels, Facebook, Twitter and YouTube are continually updated with the latest race news, positions and videos from onboard the Clipper Race fleet. One of the biggest challenges of the natural world and an endurance test like no other the Clipper Race is a record breaking 40,000 mile race around the world on a 70-foot ocean racing yacht. All that is asked of participants is a good level of fitness, an age over 18 - and a thirst for adventure into the unknown. Have you got what it takes? The Clipper Race is one of the biggest challenges of the natural world and an endurance test like no other. With no previous sailing experience necessary, it’s a record breaking 40,000 mile race around the world on a 70-foot ocean racing yacht.